Lily is a goddess, but she doesn't always like what's being asked of her. She tries to rebel against Gabriel, the man she's bound to. Lily doesn't want him to know her every move, but it might be better if he does. When a secret mission ends in disaster she has no choice but to ask for his help. Someone is trying to steal Lily's powers and that would be a huge problem. He almost succeeded once, so Lily knows what the plans are for her future. She has to fight for her own life and the lives of many others. Will she be able to win this hard and vicious battle? 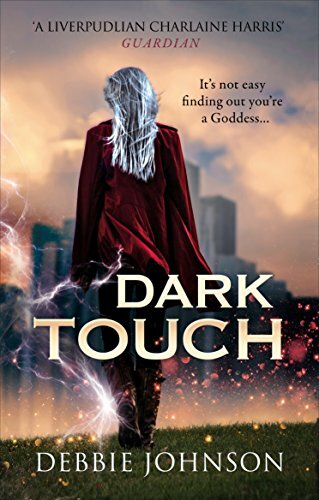 Dark Touch is a great sequel to Dark Vision. I admire Lily. She's recalcitrant, headstrong, and fierce. She goes her own way and that's exactly the opposite of what's being expected of her. Lily hasn't asked to be a goddess, but she has to get used to being one whether she likes it or not. Debbie Johnson has a terrific sense of humor and Lily's witty comments often made me laugh. She's a brilliant main character. I love her bold personality and her interaction with others is often hilarious. Even in times of danger Lily still uses her sharp mind to make clever sarcastic comments. She can be a little childish sometimes, which makes her even funnier. Lily is easy to like and the same goes for her story. Debbie Johnson is a fantastic fantasy writer. I love how she bases her worlds on folklore and gives it an interesting twist. I enjoyed reading about all the characters she's managed to come up with. They are creative and original. I appreciate it very much when a story surprises me and Dark Touch does that over and over again. Debbie Johnson has a vivid imagination and her world building is fabulous. Her settings are vibrant and dynamic, which makes them interesting. Lily often travels and she makes each journey different and intriguing. It's a quality I really like. My advise is to read Dark Touch after Dark Vision, because the story is easier to follow that way. Plus two books about Lily are better than one. I love how Debbie Johnson combines fantasy with sarcasm, it's a terrific combination. She also knows the value of friendship, which gives her story some lovely warmth. Lily is a special character and I'm glad I had the chance to read about her. Thank you for your advise. I'll hang on to that. A strong personality and a sharp wit? Lily sounds the perfect heroine! Fantasy isn't a genre that I read. (I wonder what I might be missing out on?) That being said, I can't deny when a book appears to be... well, awesome. And, to have the same characteristics that I value in books that I typically read. I'm in awe of authors who write in the fantasy genre. A friend of mine has self-published a number of sci-fi/fantasy novels, and I'm just so impressed by how he [and other authors in these genres] can so skillfully create entire WORLDS. It blows my mind! I've never heard of this series before. I'll have to check out the first book.